Share the post "Mentrual Cycles and Fibroid Embolization"
Still want to keep your fertility options open and want to continue having your period? The UFE procedure strives to rid symptoms associated with fibroids, while allowing women to maintain their cycles. Will I still have menstrual periods after I have the embolization procedure? 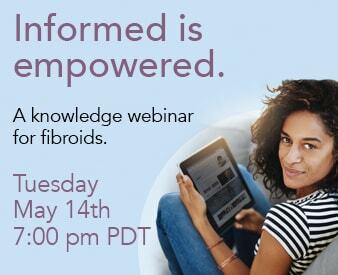 Generally speaking, approximately 95% of women will continue to have menstrual periods after Uterine Fibroid Embolization (UFE). Roughly 5% of women in one published study did enter menopause after UFE, but the reason for this is not clear. It may have been coincidental, but there is also a small possibility that some of the injected particles caused a reduction of blood flow to the ovaries. Additionally, if you are reaching the typical age range in which most women experience menopause, there is a possibility that you may enter menopause, but often times this is not caused by the procedure itself, but rather a natural phenomenon that is unavoidable. At any rate, most women continue to have their periods and are often happy to find that they no longer experience the burdensome symptoms that they experienced prior to UFE. After UFE periods are often much lighter, less painful, and quite manageable. UFE patients are usually very satisfied and come out of the procedure with the advantage of having normal menstrual cycles, leaving their fertility options open. To learn more about fibroids and the embolization procedure, please feel free to contact the Fibroid Treatment Collective at 866-362-6463 or request a free phone consultation. We would love to help you answer any additional questions that you might have or help you find out of UFE is an option you would like to explore!